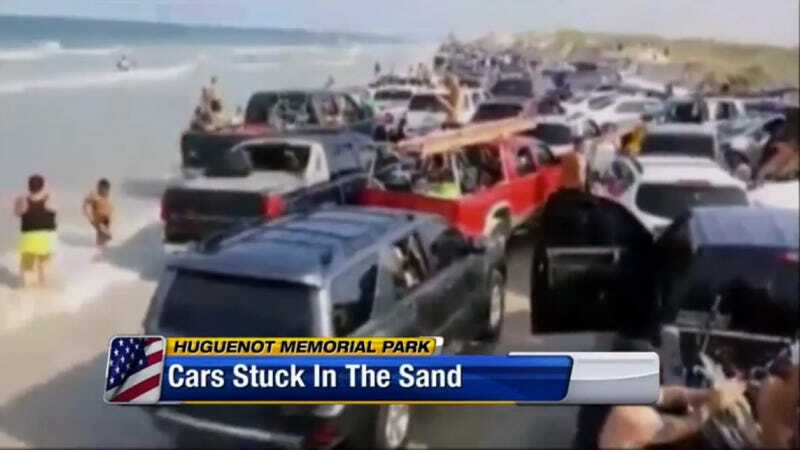 Over 100 vehicles got a salt bath at Huguenot Memorial Park in Jacksonville, FL over Memorial Day Weekend when a car got stuck and blocked the only escape from rising tide. Somebody complained "they were not warned." Not sure who could have possibly issued a warning that a vehicle might get stuck in the sand, or that the tide would return that day just as it had every day before, but in fairness I'd be pretty pissed if my truck got stuck in the ocean too. Driving on the beach can be fun, though I'm not really sure why you'd want to re-create a Wal-Mart parking lot next to a perfectly good ocean. Anyway, everybody was having a good old time when apparently some goofball got stuck in the exit and ruined a lot of people's weekends. WBTW says the bottleneck had some beach goers stuck for up to three hours. News4Jax puts the vehicle count "in the hundreds," which is a lot of folks with oversand permits who don't know how to recover a sand-mired vehicle. It seems that nobody was hurt, but some of these cars, trucks, and SUVs are going to be plagued with electrical gremlins and catastrophic rust for the rest of their lives.